Waking up early isn’t everyone’s cup of tea, that’s the reason why we use alarms clocks. Yet the struggle to wake up early in the morning is very much real. Back in days, when smartphones aren’t a thing, regular table clocks were doing their job just fine. 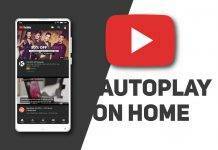 But now with smartphones, there are a lot of apps with variety of features, that are striving to wake you up everyday in the morning. The default clock app is just fine for the alarm thing. Yet for those who are used to skip those alarms by snoozing them, the default app needs to step up its game. 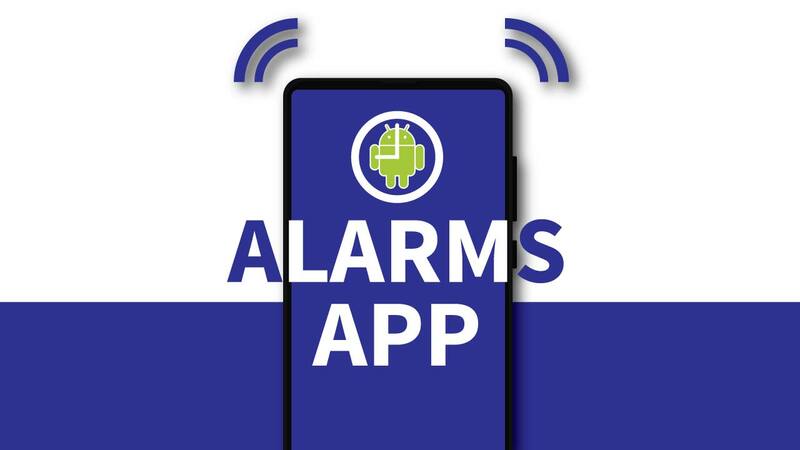 Fortunately, there are plenty of alarm apps available on Google’s Play Store, that can actually challenges you to wake up. These apps do have a bunch of challenges, that you need to complete to turn off your alarm. And somehow these challenges are enough to get you out of the bed. 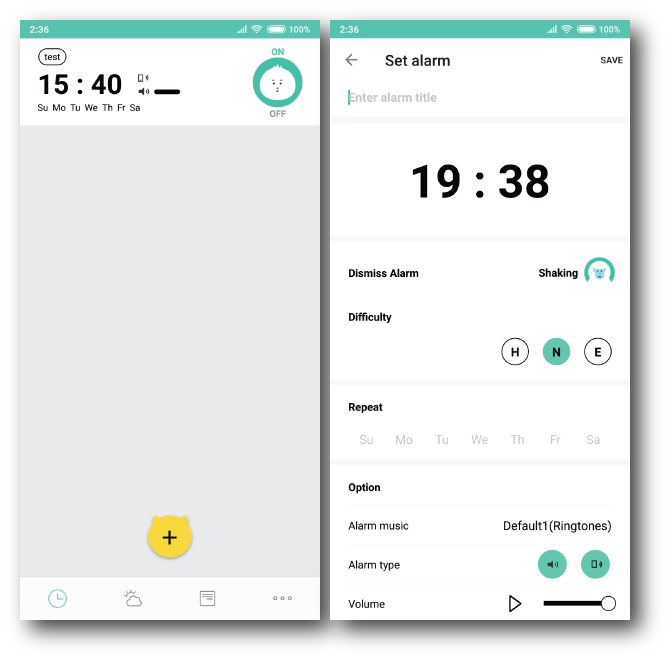 We have put a couple of Alarm Apps that offers challenges to wake you up, let’s have a look in all of them. Read more about Top 4 Watermark Free Video Editor App for Android! Shake-it Alarm is one of those alarm apps that requires you to shake your phone to turn off the alarm. You need to set a difficulty for the challenges, which requires how long you’d have to shake your phone to turn off the alarm. You will see a progress bar on the alarm screen, which will move soon after you start shaking your phone. Although, challenges aren’t limited to shaking, you have tapping & shouting challenge as well. And if you are unsure, then you can use random challenge before you save that alarm. Once the alarm is turned off, app will show you a screen with current weather’s info & top news served via Google News. 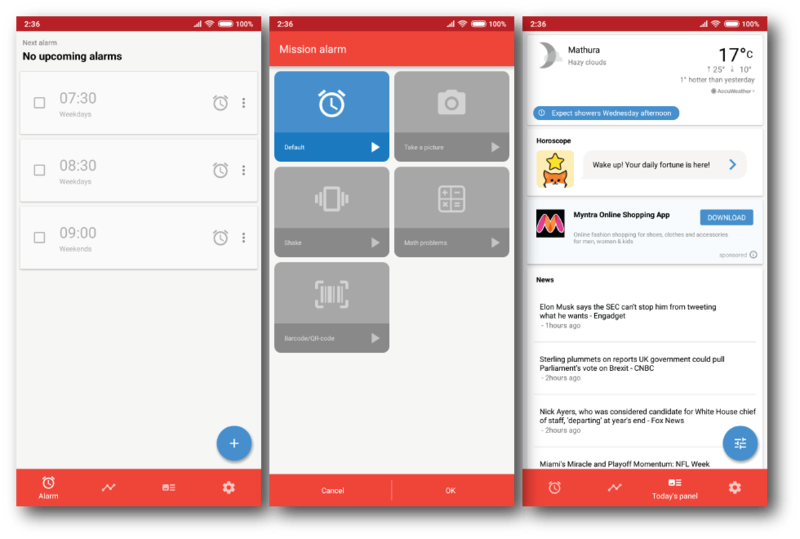 This alarm app also have a chat functionality, where you can chat with different Shake-It Alarm users & make them your Good Morning friends. The UI of this app is bit funky, yet clean so users wont face any difficulty navigating throughout the app. 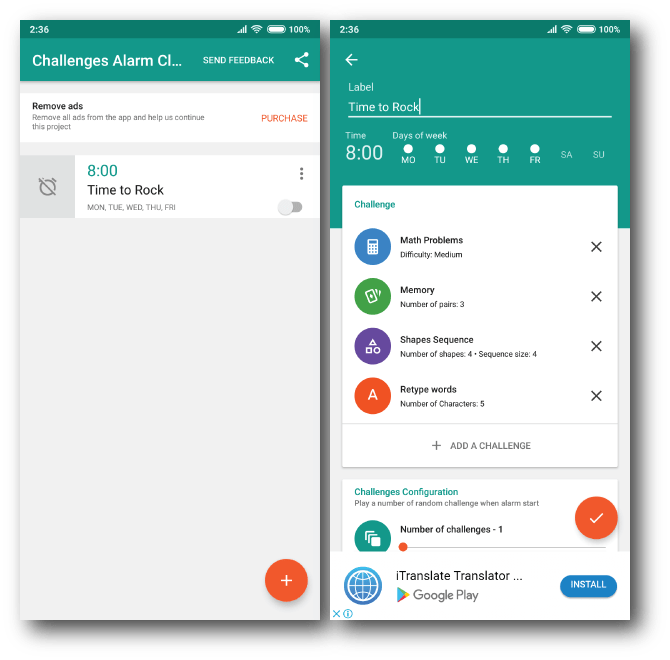 Challenges Alarm Clock is a very straight forward alarm app with no bell whistling features. You will get a couple of challenges that you need to complete to turn off the alarm. Challenges includes taking a picture of predefined object from the list, Math problems, Shape Sequences, Memory based challenge, smiling selfie & typing a random words in the given order. You can add more than one challenge to wake you up or allow the app to surprise you with a random challenge(s). You can also change snooze limit & duration. The app uses a minimal material UI with in-app ads, which you disable by a simple in-app purchase. 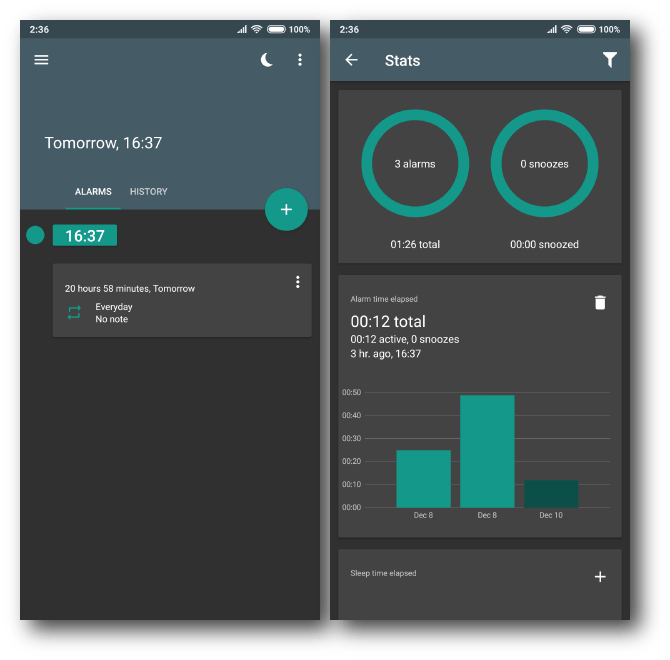 AMDroid is a feature-rich alarm app, that allows you to create personal profiles based on your alarm preference. These profiles will determine how your alarm should be, to wake you up in the morning. You can also sync calendar so that you can change alarm’s behaviour during important dates (or holidays). You can also restrict alarm to certain areas based on your location. Your alarm will not ring if you are in the restricted area. This alarm app does also collect your sleeping data to give you an analytics based on your sleep & your interaction with alarms. The challenges includes captcha challenge, Note Challenge, Math Challenge, Wi-Fi Challenge, NFC Challenge & Barcode/QR Code challenge. You can also set a backup challenge, in case you failed to pass the main challenges for some odd reasons. The app UI is clean & modern, but initial profile setup is complicated. Otherwise, it’s a good alarm app which does more than setting up an alarm & can track your sleep as well. 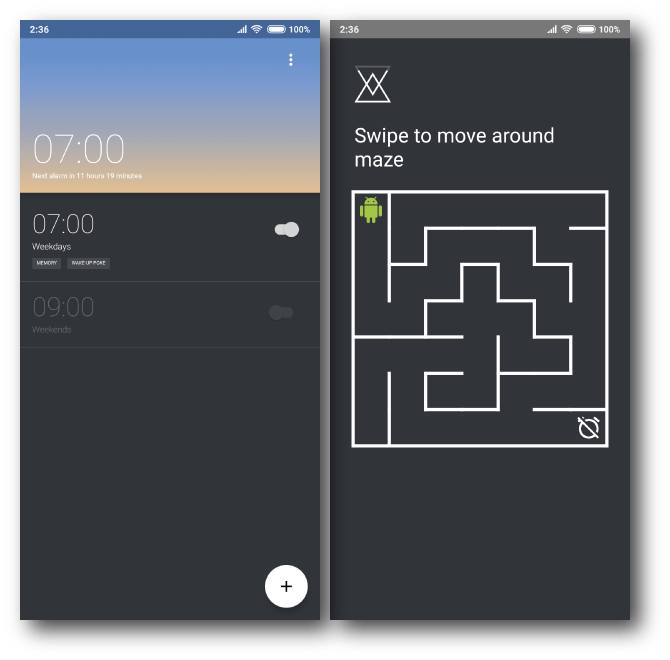 Puzzle Alarm is another alarm app with a simple & straight forward UI. You can either add a simple alarm or an alarm with different challenges & add ons to streamline the experience & wake you up on time. The highlight of this app is the puzzle based challenge called ‘Maze‘. In this challenge, you have to move the Android mascot to reach the finish line, which will turn off the alarm. Few of the features/challenges are limited to pro version. Fortunately, as a part of promotion you can get this app for free, by referring this app to 5 different users from the app settings. That will enable all pro features inside your app. Alarmy is the most popular alarm app in playstore. It allows you to customize the app based on your sleeping habits by asking couple of questions during initial setup. Once the app is set up, all you need to do is set an alarm, with the missions of your choice & you are good to go. It includes missions like taking a certain picture, shaking phone, solving a maths problem & scanning a QR/barcode to turn of the alarm. The interface & layout of the app is very easy. It also shows you weather report, horoscope & news after alarm goes off. Also, you can see your alarm history to get sleep analytics of how your are actually interacting with the alarm. Alarmy allows user to lock the app so that one can’t delete it to bypass the alarm. If you look closely, each app is capable of waking you up with the help of challenges they offer. It is all closed down to your personal preference, that which app will work for you. We love how Alarmy allows you to customize the app experience based on personal sleeping habits, while AMDroid being a full fledge alarm app that gives you analytics based on the sleeping pattern. The only thing that bothered us are the in-app intrusive ads in all of the mentioned apps. All alarm apps will show you ads after alarm screen goes off, which is annoying at time. You can however, buy the full version of all the apps to get rid of the ads, but Puzzle Alarm is the only app that allows you to upgrade for free by referring this app to 5 different users & get an ad-free experience. Are you someone who still struggles waking up in the morning? Which alarm app does help you get rid of this struggle? Do let us know via a comment. Previous articleTop 4 Free Android Video Editor App without Watermark! 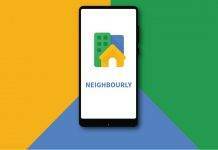 Next articleNeighbourly- An app for trusted neighbourhood answers!